For students interested in the classical world this degree provides a focus on the art and material culture of Greece and Rome. The programme includes a basic grounding in at least one classical language, fundamental aspects of archaeology, and field visits to develop a first-hand acquaintance with sites, museums and objects. Most of the degree is structured around a combination of core and optional modules. In your first year, you will receive a solid grounding in both the practical and theoretical methods in archaeology, as well as an introduction to the study of ancient languages. 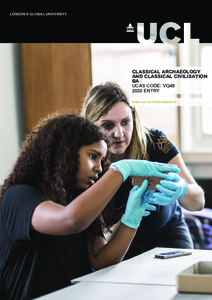 The second and third years provide a more advanced understanding of archaeology and allow you to develop your own specialised interests by choosing optional modules in particular subject areas. All students registered for this degree are required to undertake a four-week study visit to the Mediterranean as part of their 70 days of fieldwork. This is an individual programme of visits to sites and museums around the Mediterranean developed by you in conjunction with the degree co-ordinator. The study tour allows students to pursue aspects of their first two years of coursework in more depth, and prepare for their final-year dissertation, through extended critical first-hand examination of sites and artefacts of the ancient Mediterranean. In the third year you are given the chance to reflect critically on your fieldwork experience during the degree through a fieldwork portfolio or fieldwork study report, and to write a 10,000-word dissertation on a detailed subject that you will choose with the help of a supervisor. In addition, you will also take 1.0 credit of Ancient Greek or Latin modules. A further optional module to be chosen from a range in consultation with your Personal Tutor. Additional optional module to be chosen from a range in consultation with your Personal Tutor. Coursework, typically 1,500-2,500-word essays, is used to assess most modules. Most compulsory modulses and some optional modules involve an examination element too. The completion of 70 days' fieldwork is a requirement for all archaeology students. This includes a four-week study tour for Classical Archaeology students. The UCAS application forms are assessed by a central UCL team and the Archaeology department. The personal statement and predicted grades are used for assessment and sometimes extra information is requested.